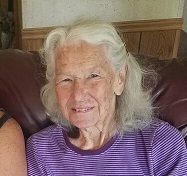 Ellen Reynolds, loving wife, mother, gramma, great gramma, sister, and friend peacefully passed away on January 19, 2019 at her son’s home in Vernal. She was born in Elizabeth, Pennsylvania on September 18th, 1927 to Alvin and Beatrice Rieske. She was raised in Texas and Alpine Utah. Ellen married her husband, Adrian Kenneth (AK) Reynolds March 1953 and lived in Green River, WY. They moved into Daggett County in 1954 were they owned and operated the Red Canyon Lodge for 35 years. They retired to the Eagle Creek Ranch near the Red Canyon Lodge. She loved working on the ranch. Some of her fondest memories were sitting on her porch and visiting with family and friends while enjoying the wildlife and view. She is preceded in death by her husband AK, brothers Lester and Virgil Rieske, and infant son Brent. She is survived by her sister Goldie Honey, son Bret (Laurie) Reynolds, daughters Carolyn (Guy) Buckner and Tamara Twitchell, five grandchildren (Kenneth Gifford, Katie Buckner, Lynnette Crane, and Joseph and Shawn Reynolds) and seven great grandchildren. Services will be held Saturday, January 26, 2019 at 11 A.M with a viewing an hour prior at the Blackburn & Sons Vernal Mortuary & Sons Cremation Care.